Plot : Rudraraju (Satyaraj) marries two women for the sake of a boy child, who will vary forward his lineage. He prepares for third marriage too, but he stops and cancels the marriage once he gets to know that his son, Krishna (Karthi) is born. Performances : Karthi literally carried the film on his shoulders with able support from all the actors. He looked lovely as a rural guy with huge regards for his occupation as a farmer and as a person who takes pride in living and sharing life with everyone. Sayyesha Saigal is finally putting all the right steps forward to become a good actress rather than just being pretty doll who blabbers on screen. Satyaraj and Bhanu Priya steal the show in few scenes and all others are good. Technicalities : Ruben’s cut for the film is a bit uneven as the melodrama overdose is felt at the climax of the film. While the script might have demanded it so, he could have edited out few portions to make it even tighter. Velraj’s cinematography is a major highlight of the film. He captured the essence of the rural area with his camera and presented everything pretty well. D. Imman made the music sound more loud and BGM is even louder. But sound if isn’t played well with it turns into noise. Had he thought about it, the movie would have had a consistent album. Pandiraj prefers to go the 90’s route with a cliched narration but manages to bring some freshness into the scenes, we have already seen. His writing is good in parts and lackluster in few other parts. But he manages to create a good narrative that engages us through out. Still as there is nothing we haven’t seen already we can’t appreciate him for trying harder. Analysis : In a movie that has Karthi and Suriya involved, you expect something fresh or a well-executed film. Pandiraj manages to craft second variety of film that we don’t mind watching one time at a theatre all due to its old school style of writing and good execution. Other than that the movie offers nothing entirely new. You can watch once if you love rural films. Karthi ready for new bilingual! 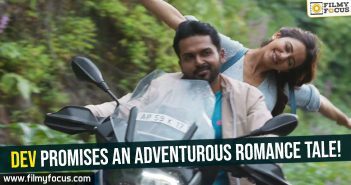 Karthi and Rakul Preet share sizzling chemistry in ‘Khakee’!